Marney has been interested in perception, consciousness and creativity for most of her life. In the seventies, she earned a PhD from the University of British Columbia on the art and poetry of William Blake. Her Blake-inspired interest in consciousness led her to study with Maharishi Mahesh Yogi in Europe, and then to devote a decade to teaching Transcendental Meditation. In the early nineties, with her youngest child in school, she decided to revisit her first passion, art. From classes in Chinese Brush Painting she learned practical techniques of brushwork and how to take advantage of the peculiar challenges and magical properties of water. From her lifelong mentor Emily Carr, she was inspired to express the living spirit within everything she paints. Marney studied with watercolour artists Caren Heine, Ann Hunter, Sheena Lott, Brent Heighton, Kiff Holland, Allan Bruce, Elizabeth Kincaid, and many others. She learned from each but went on to develop her own unique style: large, vibrant, often back-lit close-ups that reveal not only the minute particulars of each flower but also her own emotional and spiritual connection to that flower. Marney has taught watercolour classes for over 20 years, previously through Camosun College and Artworld, and more recently through her own home. In 2014 she developed an online 8-week course in floral watercolours, which enables her to reach artists around the world. Her students so far include artists from Canada, the USA, Europe (England, Ireland, Scotland, Belgium, Germany, Norway, Latvia and Russia), Australia, New Zealand, India, Pakistan, Myanmar and Hong Kong. In 2000, Marney was granted Associate Signature Status, AFCA, with the Federation of Canadian Artists (FCA). In 2011, she was granted Senior Signature Status, SFCA, the highest ranking possible with the FCA. Marney is a Past President of the Victoria Chapter of the FCA and has served as juror for a number of shows in Victoria, Nanaimo and Vancouver. In 2015, Marney was juried into elected membership with the ﻿Society of Canadian Artists (SCA). This organization is based in Toronto, but has members and exhibitions across Canada. Marney was pleased to win an Award of Excellence in her first show with them, the 47th Open National Juried Exhibition in Gainsborough Galleries, Calgary, Alberta, 2015, and second prize in their Online Exhibition in 2016. Altogether, Marney has won over 20 awards in various juried exhibitions in Western Canada, including the Annual International Representational Show (AIRS) in Vancouver. 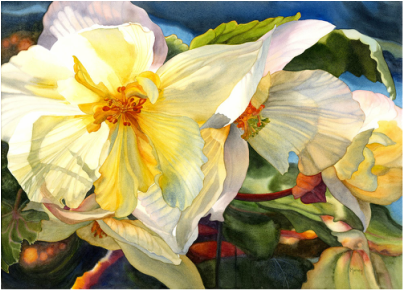 Most notably, in October 2015, her painting Butchart's Begonias won the Best Work on Paper or Under Glass in the Sidney Fine Art Show on Vancouver Island, a major exhibition which featured almost 40o juried paintings. Marney has been a regular, invited participant in the Art Gallery of Greater Victoria's annual July Paint-In and is represented in their Art Rental program. Marney has twice been featured in International Artist and her paintings have graced the front cover of Focus and Art Avenue magazines. She has also been featured in the French magazine Pratique des Arts and recently had a major, 12-page article, including 28 colour images, in the Australian magazine Creative Artist. She is very excited to be featured in the 2016 book Splash 17: The Best of Watercolor, featuring some of the best watercolour artists in the world. She is also featured in three other books: Artists of British Columbia Volume III, Coastal Moments, and The Island Illustrators Society. Marney has had two solo exhibitions with Winchester Galleries in Victoria, BC (see video below) and represented them as guest artist at The Oak Bay Beach Hotel in September, 2013. She also had a large solo exhibition at The Old School House Art Centre in Qualicum Beach in Summer 2014. Marney is also represented by The Art Gallery of Greater Victoria, Art Rentals, the world-renowned Butchart Gardens, and Federation Gallery in Vancouver, BC.